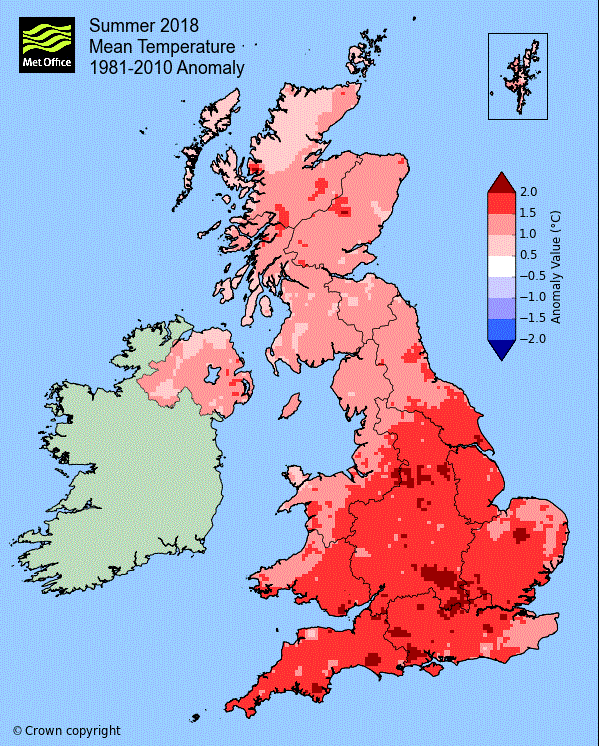 Being abroad in the Great Britain I was fortunate to witness the hottest summer, ever occured in British Isles. Because I am from Poland, in this article I wold like, at least a bit to compare last British Summer with Polish one and say a little bit about this summer in general, referring to a whole northern hemisphere. I am very surprised, that in this year I could experience a hotter Summer, than in Poland and rest part of the Central Europe. The hottest summer came after a relatively cold spring. 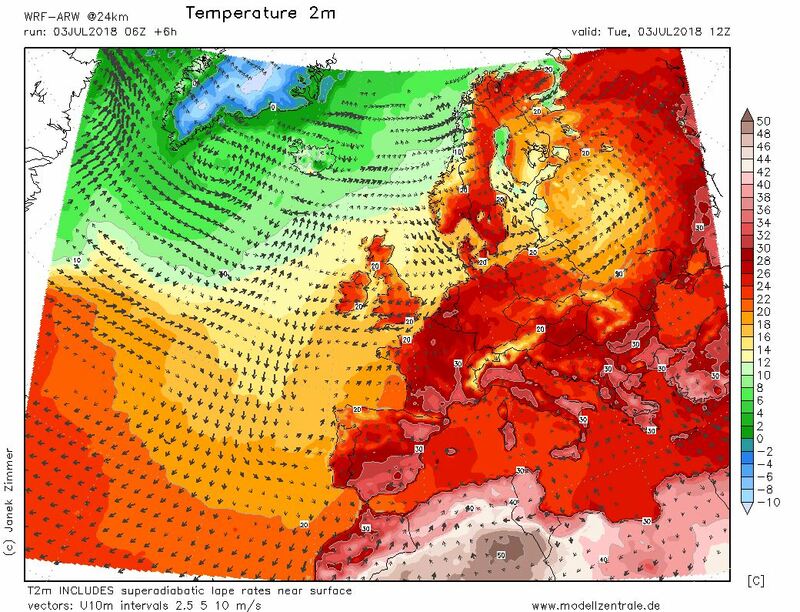 Because in the first part of the year temperatures across the UK were much lower than in previous years I didn’t suppose, that summer will come at all. A few “beast front the east” stroke the British Isles between February and April, causing lag in sprouting and vegetation development. The situation changed in mid-April, when temperature shoot up to about 25 degrees Celsius for a few days and next, after cooler period, around the May Day bank holiday. Despite late spring approaching May was the warmest and the sunniest, as recorded in the UK. The hottest summer approached suddenly. 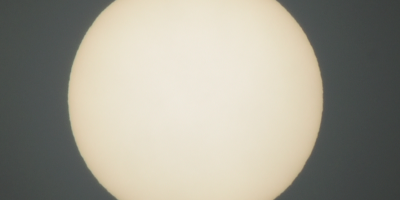 It comprised with about a 5 heat waves between 23 June and 21 September, although as far as I have noticed English meteorologists used to say “heat wave” arleady when temperature hovers around 25 degrees of Celsius. Possibly this is because of a big humidity, what is typical for maritime climes, making a feeling temperature higher than it really is. Anyway I will associate this summer with a vast five-week heat wave, that resulted a huge drought across the country and, what is irritating, terminated a few hours before total lunar eclipse. The summer in Britain began on 22nd of June, where a heat wave was officially declared in Scotland and Northern Ireland. The temperature there rose above 30 degrees Celsius, what was not observed since 2003. In another parts of the country the heat wave began on 23rd June. After a few days an intense hot the wildfires were reported. 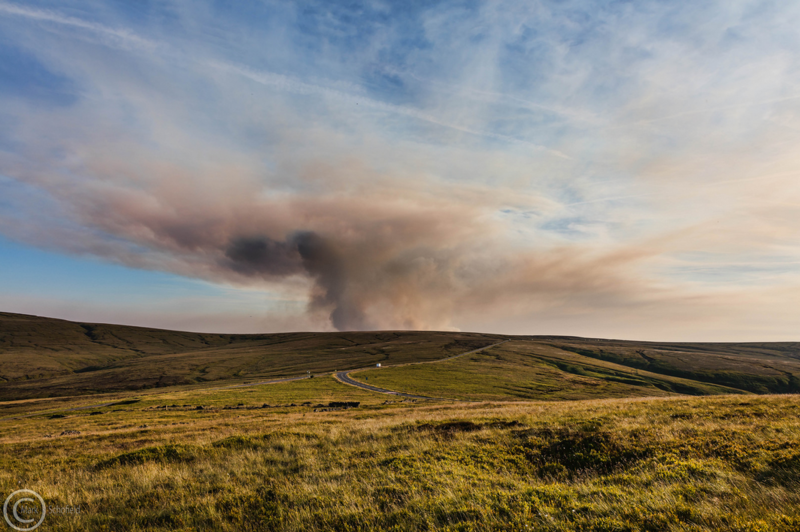 The two largest wildfires at Saddleworth Moor broke out on 25 June and they was the largest wildfires in Englands living memory. Pic. 2 Wildfires at Saddleworth Moor as seen from the space between 25 and 28th June 2018 (Zoom.earth). Pic. 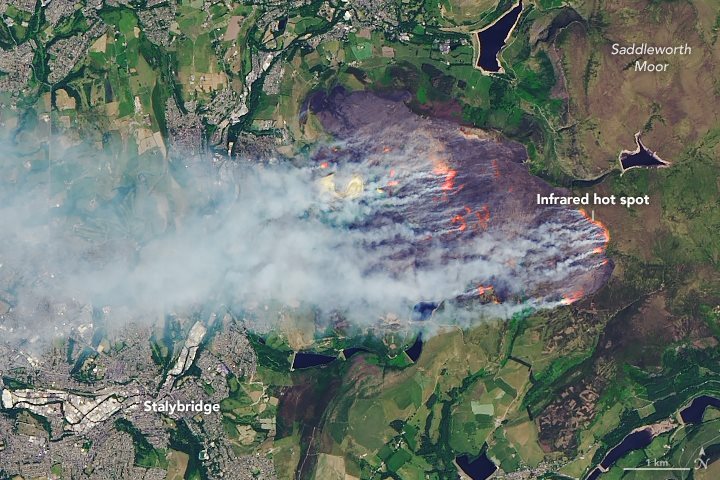 3 Wildfires at Saddleworth Moor on 27th June 2018 (NASA/Landsat). Pic. 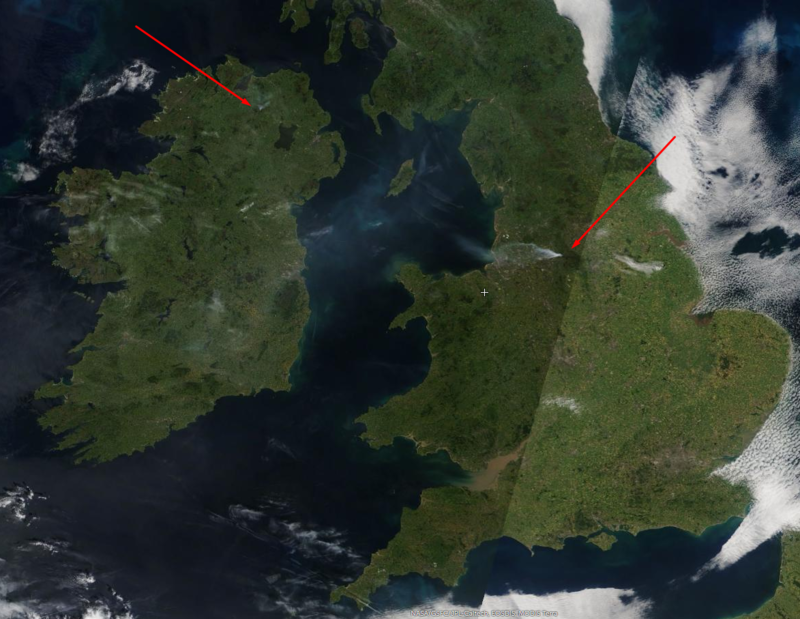 4 Two major wildfire across the Great Britain and Ireland on 27th June 2018: Glenshane Pass on the left and Saddleworth Moor on the right (Zoom.earth). Pic. 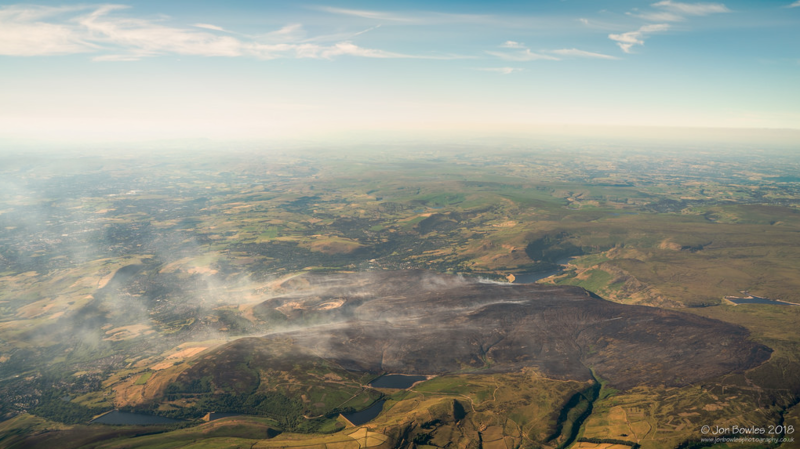 5 Still smouldering Saddleworth Moor area on 2nd July 2018 (Jonbowlesphotography.co.uk). Another wildfires were observed in Wales (Ceredigio) and at least a few different places. The another reason of wildfires, next to the heat was a breeze, that occured along with hot weather. Due to this the vegetation and underlying peat had been dried out quickly, becoming easy to burn. 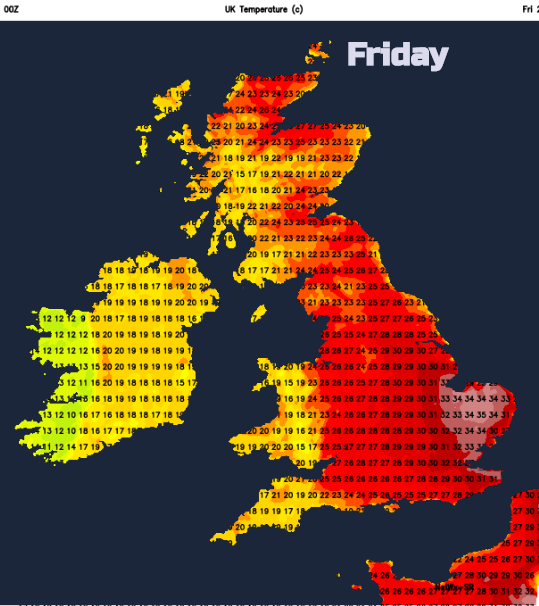 The late June heat wave set the highest temperatures in the milder parts of the UK: about 32 deg in Wales (Portmadog), 31 deg in Scotland (Aviemore, Glasgow) and 30 deg in northern England (Carlisle, Keswick) and Northern Ireland (Edenfel). Along with heat many hours of sunshine was recorded across the country. 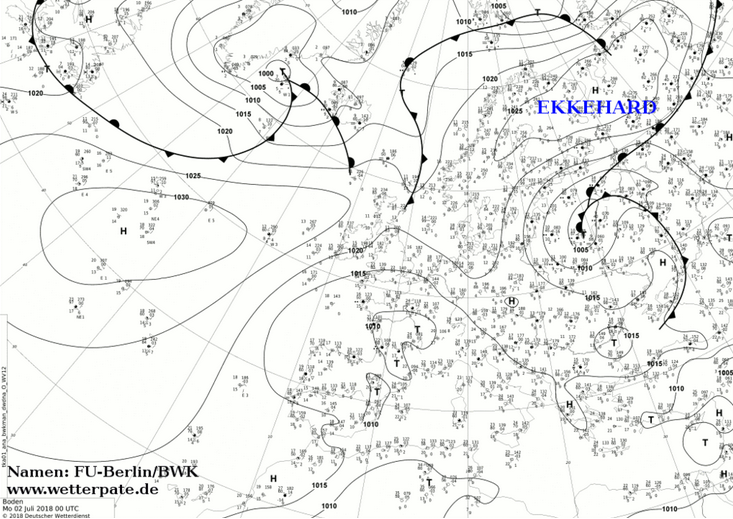 In the early July some cold front entered to the British Isles, but stopped over Ireland and Irish Sea. In the result above Pennines, Calledonian and Cambrian Mountains a heavy downpours and thunderstorms occured ocassionally. 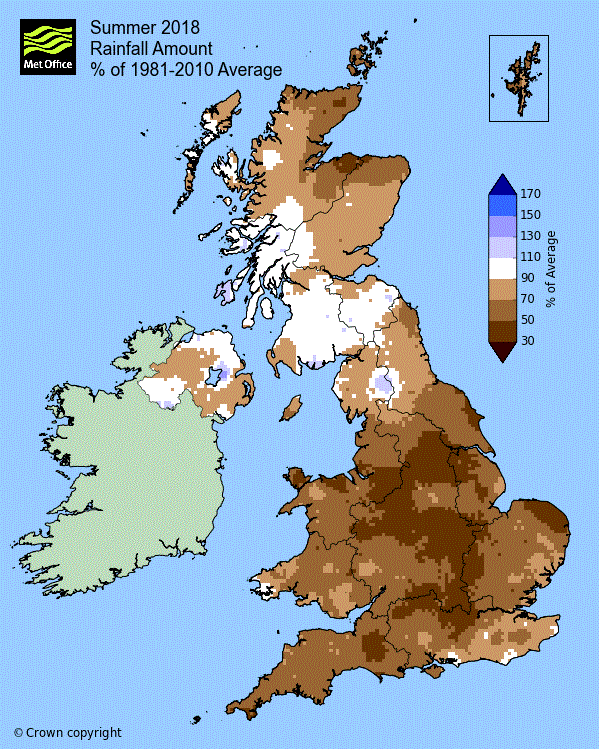 The weather in another part of Great Britain was mostly sunny, hot and dry. The continuation of the high temperature resulted such an unusual things like tarmac melting in many places of eastern UK. The asphalt concrete softening caused a freak events; a bin lorry’s back wheels sank into the road in Newbury. In another part of the country a man’s leg sank into a melted road near Newcastle. 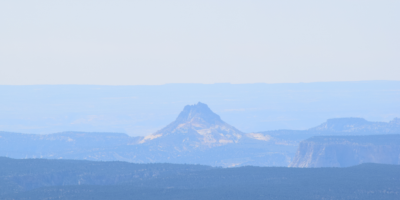 A mid-July was a bit cooler but still dry and sunny. Only a few hefty rainfalls passed in places across the England and Wales, whereas Scotland and Ireland faced more wet and colder weather. Next serious heat wave, which set the highest temperatures in southern and central England came on late July. Pic. 7, 8 A late july heat vawe at southern Britain on 26th July 2018 (Meteoblue.com/Bbcweather.co.uk). The highest temperature values were recorded in Kent and Norfolk (35 degrees Celsius). The extremely long dry and hot spell has been broken by cold front sweeping from west. Pic. 9 Temperature across Great Britain and Ireland on 27th July 2018 (Netweather.tv). Pic. 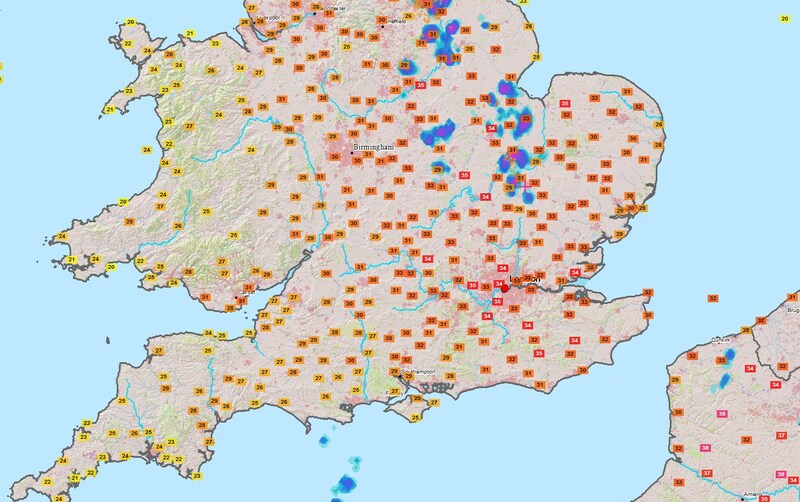 10 Temperature in south east part of the UK on 27th July 2018 (Meteoblue.com). Pic. 11 Cold front passing above western Europe on 27th July 2018 afternoon (Wxcharts.eu). Next day temperature dropped rapidly and weather changed in general, bringing a first serious rainfall on eastern UK regions. A hot weather returned in early August, however it lasted shortly, only 3 days. 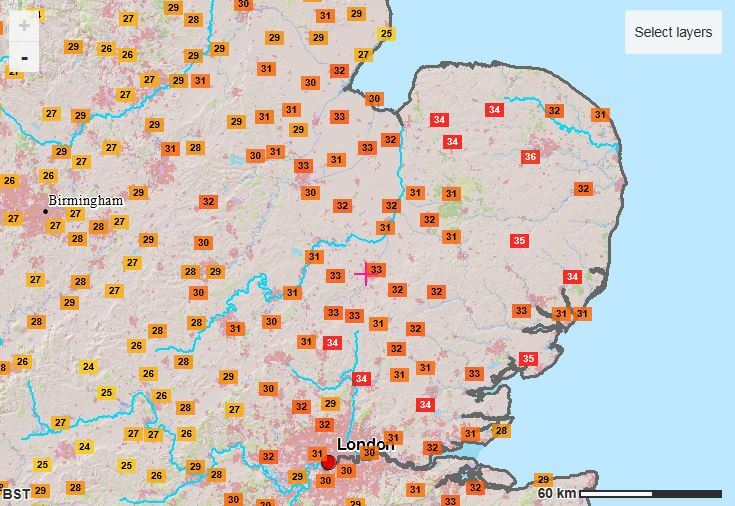 The temperature record wasn’t beaten, but termometers reached a serious values accordingly: 33 deg in London, 32 deg in Norwich and 31 deg in Cambridge. Quite high temperature was recorded that time in Wales (28 deg in Powys region) and Scotland (27 deg at Lossiemouth) and Northern Ireland (24 deg at Helens Bay). By the end the first decade of August British summer became cooler with some misty weather in places. The end of August was really cold, especially in Welsh and Scottish mountainuous areas, where in places even a ground frosts were reported (Harmon in Powys, -0.2 deg, Braemar in Amerdeenshire -1,3 deg). The warmest remained south east part of England with daily temperature between 20 and 25 degrees. September continued a warm and mostly sunny weather in Britain. In south eastern part of England, temperature was about 25 degrees of Celsius (26 deg in Cambridge). First days of September were also warm in Wales, where temperatures also reached 25 deg (Hawarden in Clwyd), Scotland (26 deg at Lossiemouth in Maryshire) and Ireland (22 deg Londonderry, 23 deg Dublin). However warm weather didn’t last long in western UK and Ireland. After 3 days a northerly outbreaks brought much cooler weather with some ground frosts recorded under clear sky conditions in Scotland (-2.5 deg at Braemar in Aberdeenshire) and lot of sunny days at once. Last warm wave was observed before end the 2nd decade of September, which marked the end of the summer. In south eastern part of the British Isles temperature reached 26 degrees of Celsius again (Cambridge), however this warm weather didn’t spread outside the English lowlands. In Wales, Ireland and Scotland weather was quite cool and unpredictable. Around 20th September a storm season began on mostly part of the UK. First storm Helene brought very windy conditions to Ireland and many parts of western UK. Next storm Ali approached 2 days later and featured much more windy conditions, defeating a warm air mass from British Land on 21st. The 21st September marks definitely the end of the summer then. Concluding a whole scenario described above the period of most severe hot weather occured between 22nd June and 27th July, without any precipitation, at least in Cambridge. The long period of dry hot weather, usually without unpleasant level of humidity caused one of the biggest drought in the UK history. It was the biggest drought since 1976. In the effect in many regions of the Great Britain and Ireland a hosepipe ban was introduced. The long heat wave changed scene a lot. 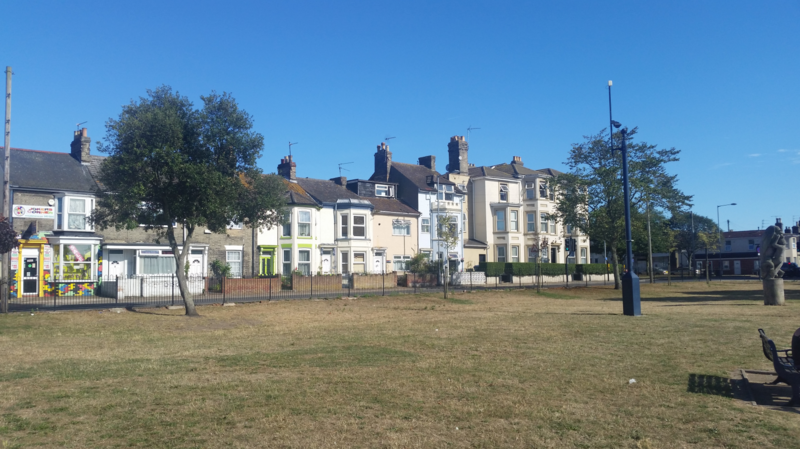 In every parkland and garden squares was turned into a brownish, sunbaked and parched areas. Pic. 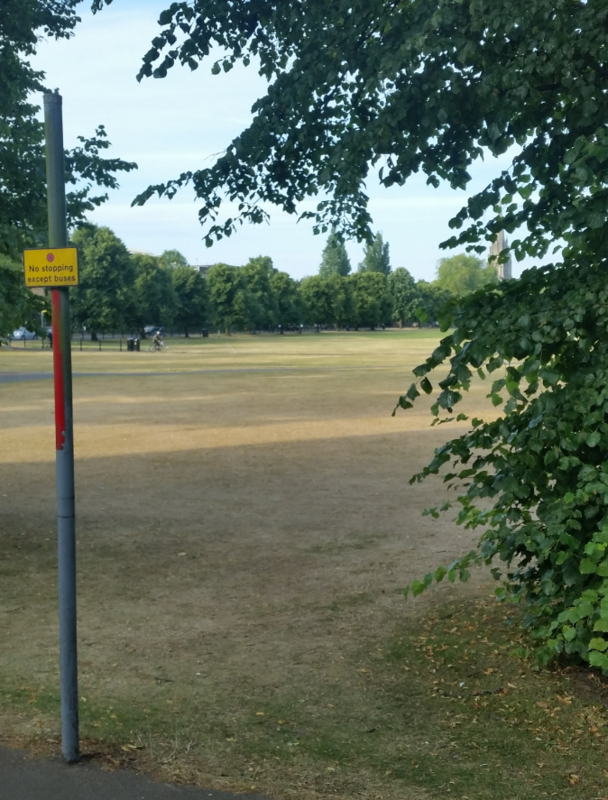 12 Parched Parker’s Piece in Cambridge on 7th July 2018. Pic. 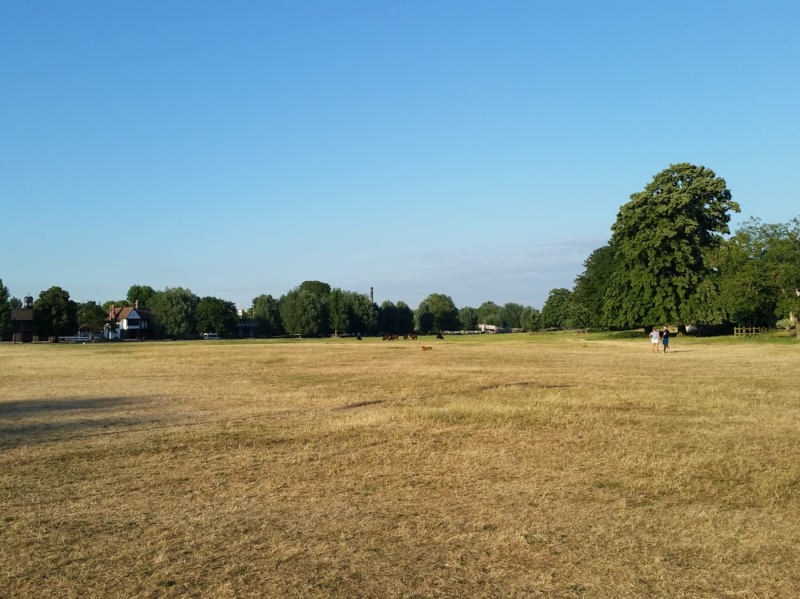 13 Parched Petersfield Play Area in Cambridge on 7th July 2018. Pic. 14 Dried up Christ’s Piece in Cambridge on 7th July 2018. Pic. 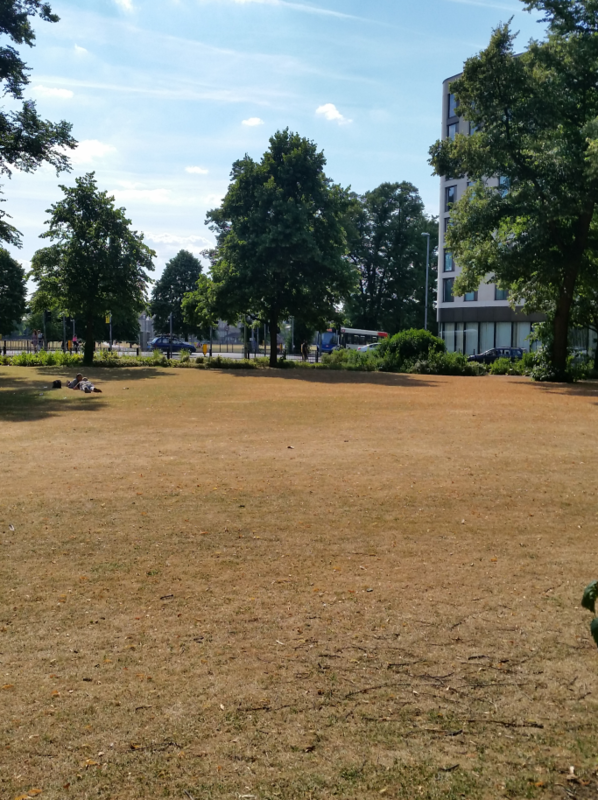 15 Dried up a Midsummer Common area in Cambridge on 8th July 2018. Pic. 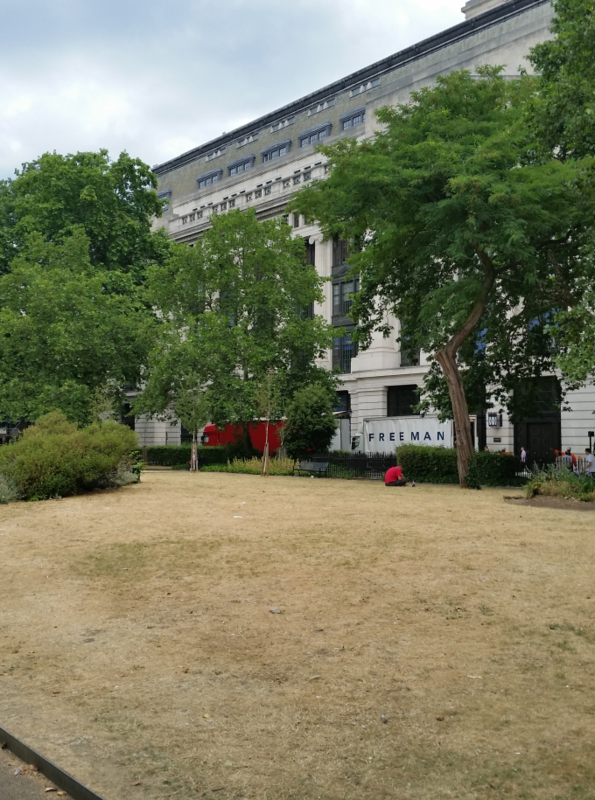 16 Dry Bloomsbury Square Garden, just behind the Victoria House in London on 9th July 2018. Pic. 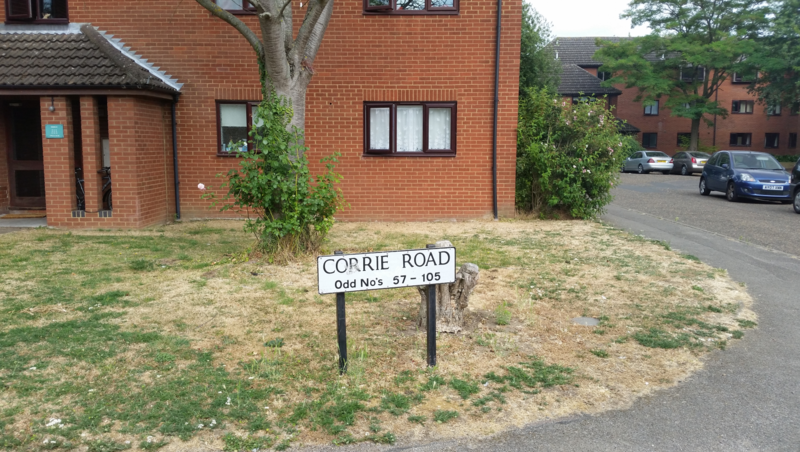 17 Unusual drought in Cambridge on 18th July 2018. Pic. 18 A drought continuation during the last serious heat wave, Great Yarmouth, 5thAugust 2018. Pic. 19 A historical drought in the UK, as seen on satellite imagery (Worldview.earthdata.nasa.gov). Pic. 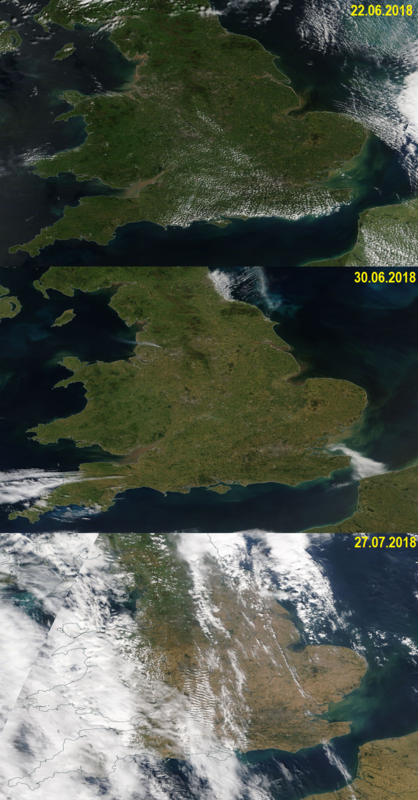 20 South eastern part of Great Britain on the satellite imagery during the 2018 historical drought (Worldview.earthdata.nasa.gov). This drought has been saved not only in pictures and satellite imagery, but also in the main climate graphs (mean temperature anomaly and precipitation). Pic. 21 Mean temperature anomaly on Summer 2018 (Metoffice.co.uk). Pic. 22 Total rainfall amount during summer 2018 (Metoffice.co.uk). The extremely hot weather was reported in many regions of northern hemisphere from North America to North Asia. In western Canada temperature reached 40 degrees of Celsius in August. In many places a new heat record has been set. 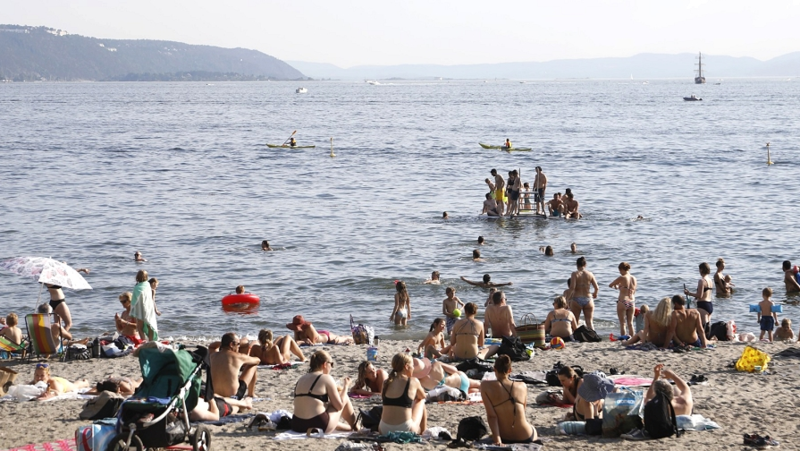 In Quebec and Ontario temperature rose up to 35 degrees of Celsius. We must be aware, that in terms of the humidity the humidex values could be much higher! Much stronger heat wave touched western USA, where temperature skyrocketed to 47 degrees of Celsius near Los Angeles and even 51 deg in Death Valley. Extremely high temperatures occured also in Mexico, where in Chichuahua region was between 45 and 50 degrees of Celsius. The North American heat wave caused a lot of wildfires and deaths. A record breaking heat wave affected also Japan, Korea and China, where temperature hovered about 40 degrees of Celsius. In the effect at least 200 people died from heart-related causes. Another over 70000 required hospitalization. In the Middle East, in Oman the highest “low” temperature in known history has been recorded. On 26th June the low temperature was almost 43 degrees of Celsius! At Quriyat. The hot weather didn’t miss also the Europe, however higher temperatures than normal were not observed on a whole continent. On top of that heatwaves didn’t hit a whole continent at once. Whilst in some regions an unusual hot was reported, in other parts of the continent people were strugling with weather not adequate for location and part of the year. For instance when United Kingdom was facing a historical heat wave, the Dalmatian coast experienced a huge and quite often cold outbreaks with severe thunderstorms. Pic. 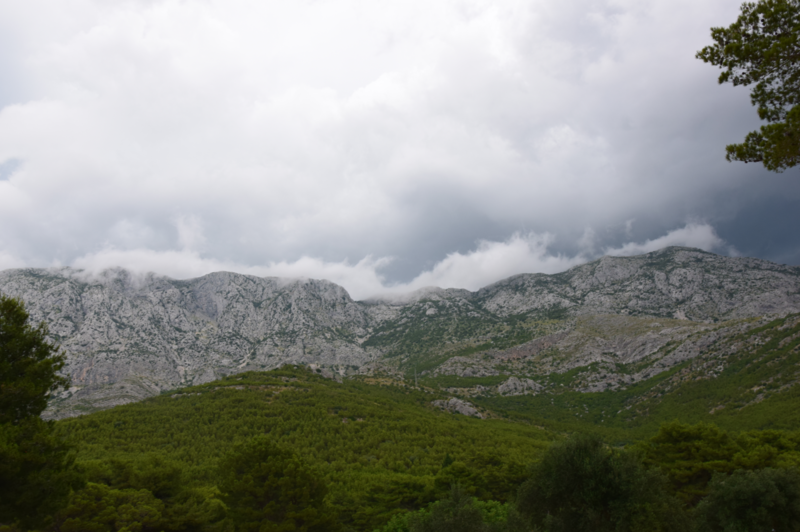 23 A Velika Kapela mountain community (near Blato village, Croatia) veiled by stratus fractus during the thunderstorm on 22nd June 2018. Pic. 24 Hvar island (Croatia) soaked up with torrential rain on 22nd June 2018. Pic. 25 Cloud coverage above Europe on 22nd June 2018 (https://worldview.earthdata.nasa.gov). 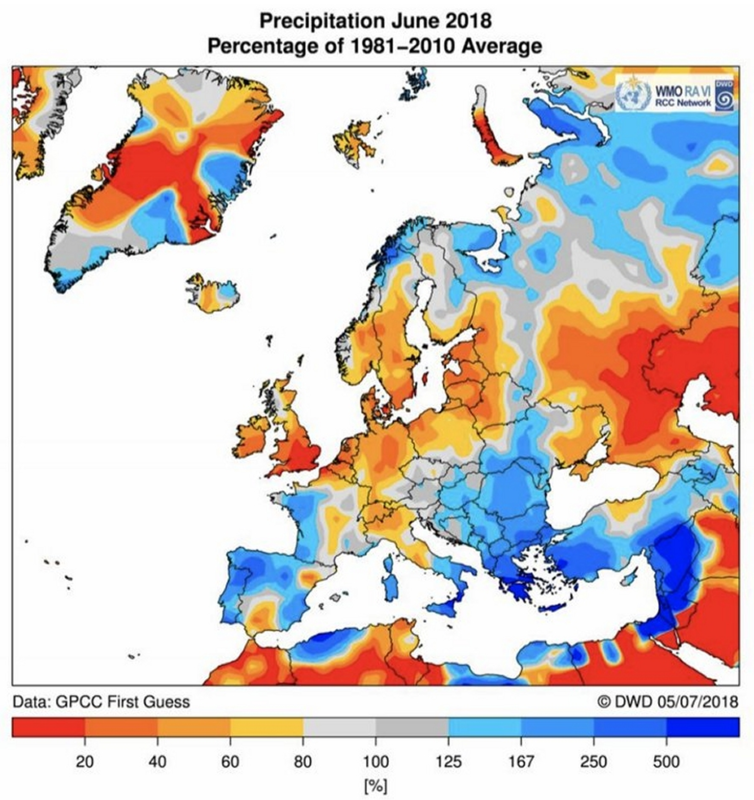 In general June 2018 has been remembered as an one of the most wet Junes in south eastern Europe. 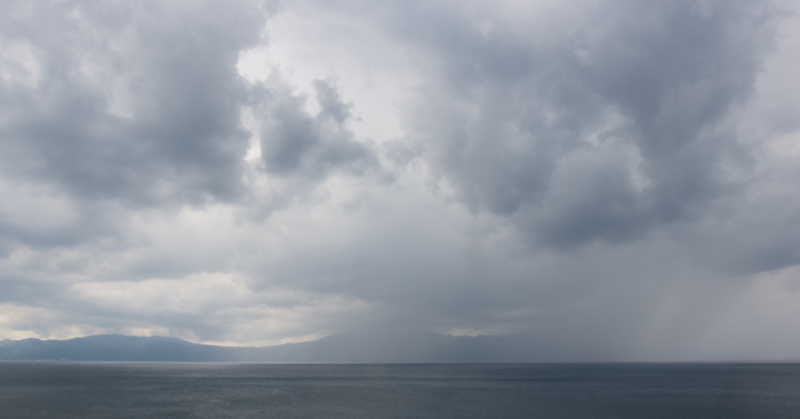 Rain, thinderstorms and flooding occured especially in Greece and southern Italy. In the same time a considerable drought was occured in the Baltic and North Sea region. Pic. 26 Precipitation in Europe, June 2018 (DWD/WMO). 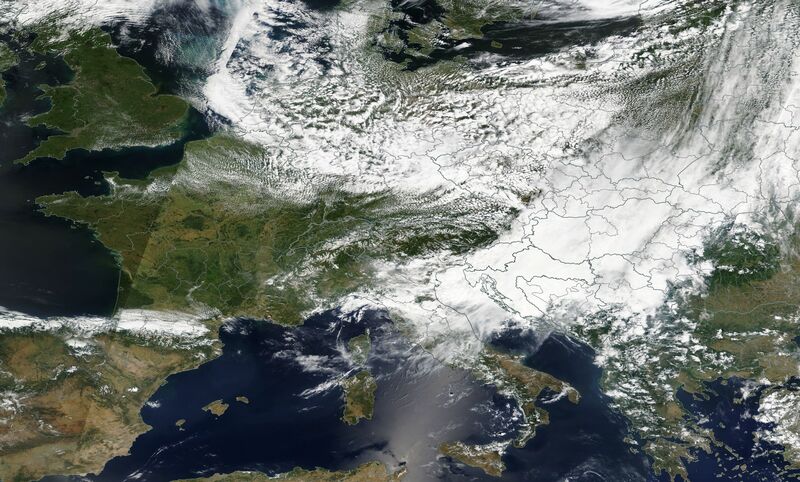 An early July brought an extremely low temperature in central and eastern Europe. The maximum temperature recorded in Belarus and north-eastern Poland was one of the lowest observed in known history. In places the maximum temperature didn’t even reached 12 degrees of Celsius! The lowest maximum values of temperature were observed in Bialowieza (about 11 deg), Baranovici (11 deg), Pinsk (11 deg ). Pic. 27 Very cold day in Poland on 2nd July 2018 (meteomodel.pl). Pic. 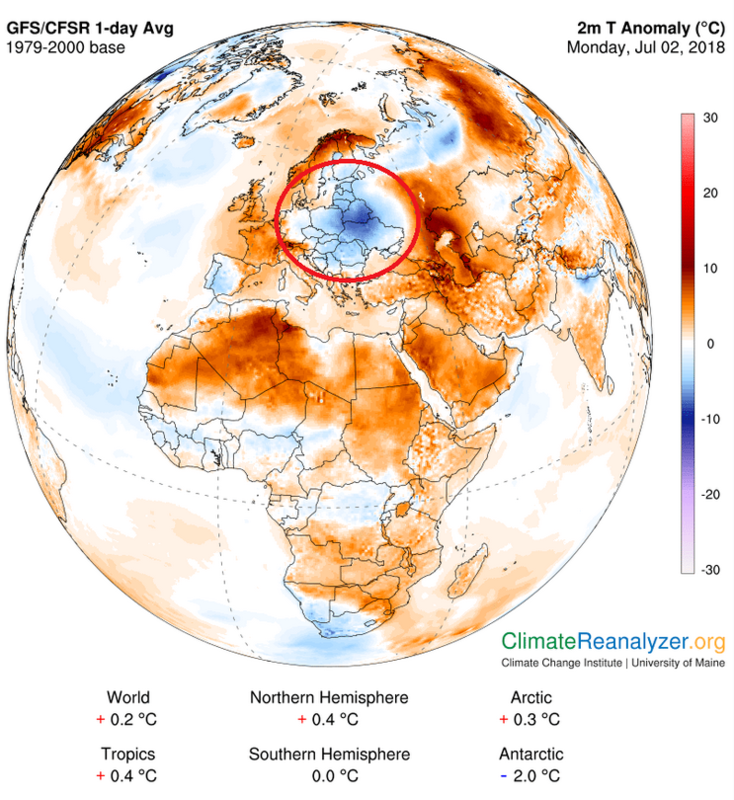 28 A cold blob in central Europe o 2nd July 2018 (dobrapogoda24.pl/climatereanalyzer.org). Pic. 30 A synoptic map on 2nd July 2018 for Europe and north Atlantic (wetterpate.de). Pic. 31 A cold blob receeding from central Europe on 3rd July 2018 (modellzentrale.de). The low pressure area presence with cloudiness prevented these region from ground frosts, which occured more westwards in Poland. The lowest ground temperature has been recorded in Jakuszyce (-4 deg, Wierzchowo -1.5 deg and Swieradow-Sudow -0.5 deg). In Jakuszyce frost was reported even on 2m above ground (-1.5 degrees of Celsius). Pic. 32 Cloudiness and precipitation in Poland on 2nd July 2018 night (meteomodel/DWD). 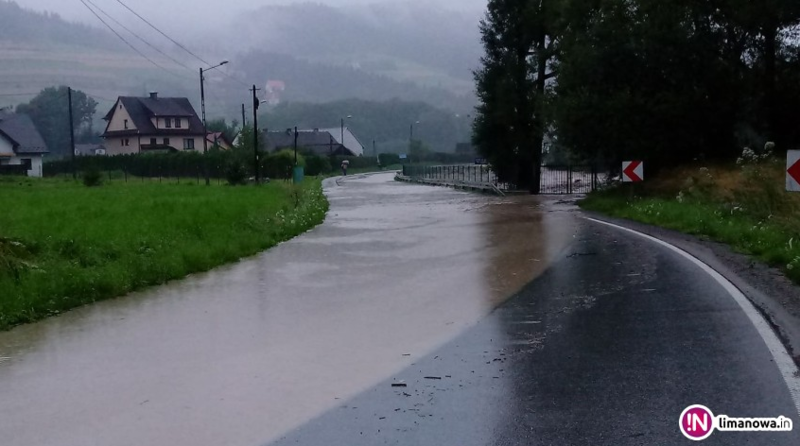 Most of July in Poland, especially the southern-mountainuous part of the country was raining causing flooding, which is nothing unusual in this month. Pic. 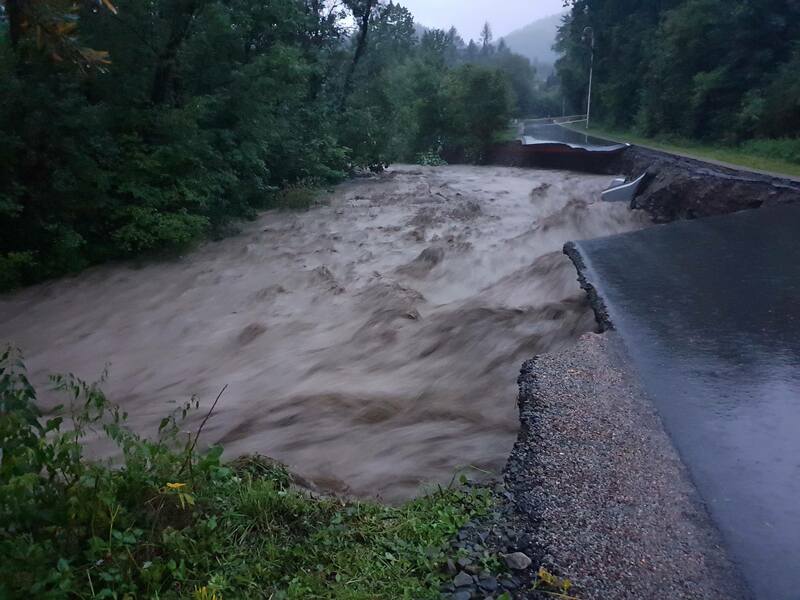 33,34 Floody 18th July 2018 evening on the Łososina river near Limanowa (Lesser Poland)(meteomodel.pl/limanowa.in). 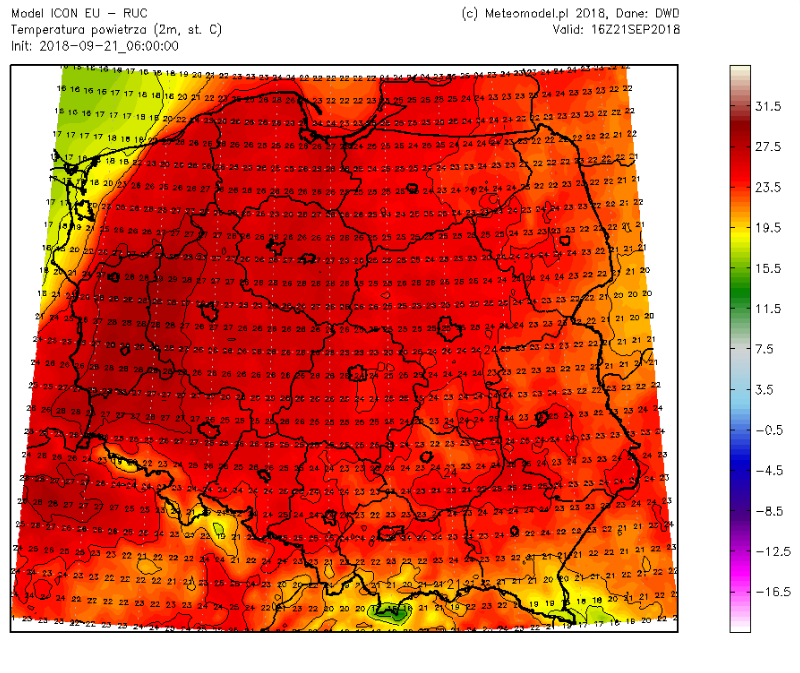 A heat waves started to hit Poland seriously by the end of July. Earlier a hot weather reached northernmost part of the Europe, where more than 30 degrees of Celsius has been reported. On the Barents Sea coast, in Makkaur Fyr temperature reached a score value – 31 degrees of Celsous! On the coast inside the polar circle at almost 71 north latitude! Pic. 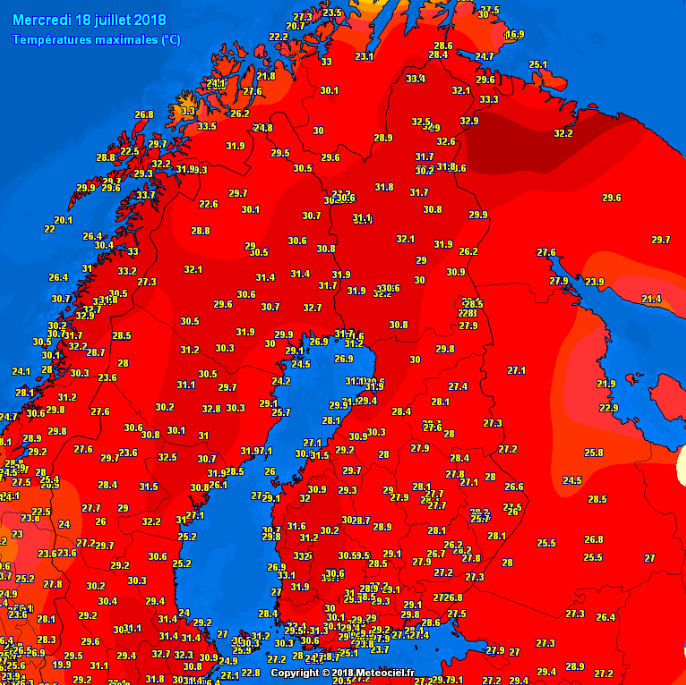 35 Scandinavian heat wave on 18h July 2018 (meteociel.fr). Another the highest temperatures in known history as were recorded in Arctic Circle was reported in Utsjoki (Finland) – 33 deg and Banak Penninsula (Norway) – 32 deg. In many places across the continent the temperature values has not been seen from at least tens years. This serious heat vawe, lingering nearly 2 weeks above Scandinavia caused a lot of wildfires, observed mainly in Sweden, which was the most affected by hot weather. The Swedish firefighters were not prepared for such a large scale wildfire event. Then 140 Polish firemen as well as a teams from different European countries came to help them to put out forest fires. Pic. 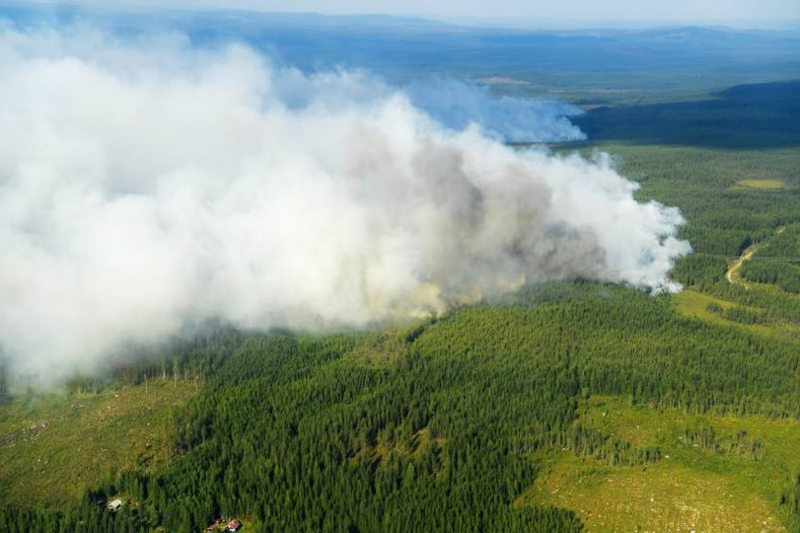 36 Wildfires around Ljusdal in Sweden on 18th July 2018 (pap.pl). 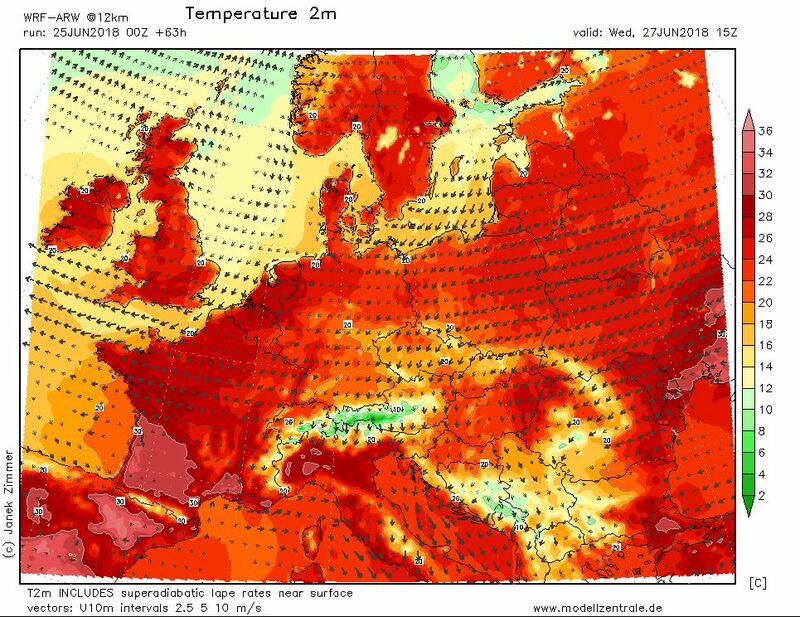 An extremal heat wave engulfed also southern and south western part of the Europe, especially in Greece, where 92 people died becouse of wildfires. Pic. 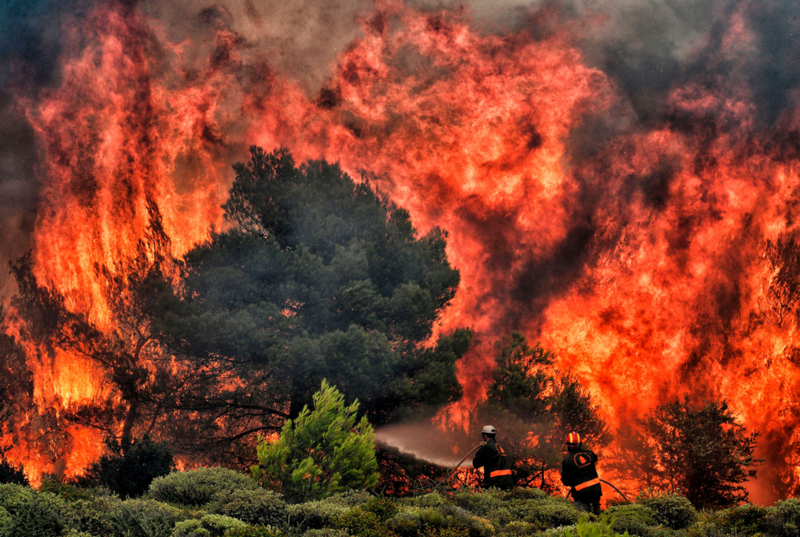 37 A firefighter battle with wildfire in Kineta near Athens (telegraph.co.uk). Another heat wave stroke on Iberian Penninsula between 25th july and 5th August. In the result about 23 people in Catalonia died. In Portugal and southern Spain temperature reached 46 degrees of Celsius on August 4th. 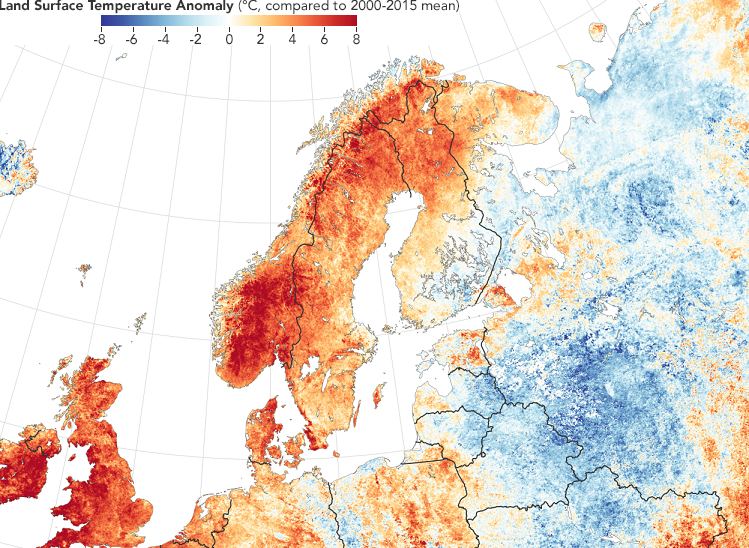 The hot weather bith in southern Europe as well as in Scandinavia condinued in August. In the result of 3-weeks hot spell in Sweden the highest peak of the country – southern summit of the Kebnekaise Mt. melted down, loosing its privilege eventually. Pic. 38 A heat wave in Norway (credits: Erik Johansen). In Poland the weather improved by the end of July and early August brought a serious heat wave with max temperatures about 35 degrees of Celsius. Next to a very hot days the temperature was high during the hight also. The hottest night was between 9th and 10th August, when in most of the country temperature didn’t fall below 20 deg. The highest low temperatures were measured in Bielsko Biała (25 deg), Cieszyn (24 deg) and Hel (23 deg). On the contrary of 1st part of August, a late period of this month was much colder. When this cold spell emerged for a while, then very low temperatures during the night were reported. Due to polar marine air mass an overnight temperature fallen to around 5-7 degrees, whereas near the ground only 1-3 degrees were reported. After this cool impact the hot tropical air masses came again, bringing hot temperatures in central and western Europe for first two decades of September. The temperatures reached to about 31 degrees in Poland, 33 degrees in Germany and even 35 degrees in France. 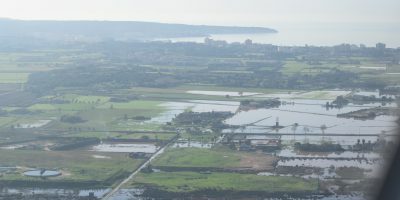 The dry and hot spell continued until September 21st, when a serious storms from Atlantic Ocean entered on the continent, reducing temperature on about 10-15 degrees. It was definitely the longest and the hottest summer ever seen in Poland and one of the warmest in western Europe. I wrote western, becaus higher temperatures than normal were not observed on a whole continent. Pic. 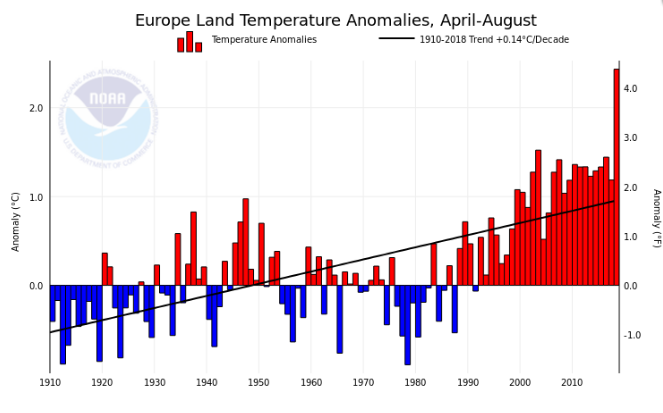 40 Europe Land Temperature Anomalies since April to August 2018 (NOAA). Undeniably the most affected was southern and western part of the continent with British Isles. Surprisingly also on Scandinavian Penninsula has been strongly affected by heat. The biggest positive land surface temperature anomalies has been reported for Great Britain and Ireland (up to +8 degrees of Celsius in places), Norway (up to +8 degrees in mountainuous areas), Denmark and Sweden (between +4 and +6), Benelux (about +3 degrees) and Portugal (between +2 to 3 degrees). The biggest anomalies has been reported for mountainuous and marine areas, where hot weather happens very rarely. In that areas a heat wave caused many destructions and landscape changes due to massive snow and glaciers dissapearance. The most known situation comes from Sweden, where the highest peak of this country – the southern tip of Kebnekaise, which has been shrinked for about 4 meters. The glacier enshrouding the top of a mountain melted down within 1 month. Aside for many heat strikes throughout the whole summer there were another unusual weather situations, which has made this summer quite weird. In eastern part of the continent the land surface temperature anomaly was much below an average value. In eastern Belarus the deviation reached from -6 to -8 degrees of Celsius. A relatively cool summer occured also in southern Finland, Lietuva, Latvia, western Russia and northern Ukraine. Even in the areas affected by heat wave some colder and wetter periods were reported, like Balcanian countries in June. Pic. 41 Land surface temperature anomaly in central and northern Europe in July 2018 (Wikimedia.org). Every heat wave generates environmental, economical and health effects, which are dependant on the severity of hot weather. I have gathered all pros and cons this kind of weather below based on all information gathered from last summer heat wave in Europe, especially in Poland and United Kingdom. Pic. 42 Baltic Sea surface temperature at the Polish shore on September 3rd 2018 (twojapogoda.pl/IMGW). – heat wave causes drought and very quick decrement of the climate water balance value, as we could observe in case of western and northern part of Poland. Pic. 43 Climate water balance for Poland at the beginning of July 2018 (twojapogoda.pl/IUNG). Pic. 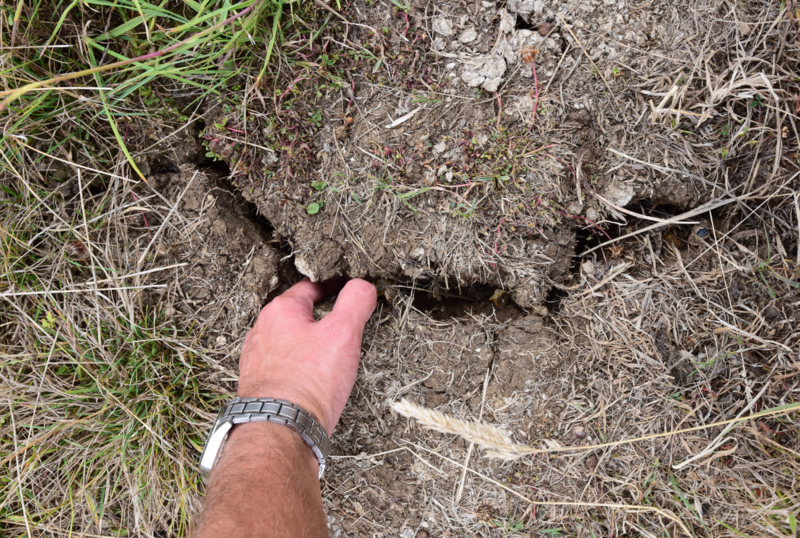 44, 45 Cracked soil seen at Pegsdon Hills, the north easternmost part of the Chiltern Hills in southern England on 11th August 2018. – The long heat wave changes scene a lot. 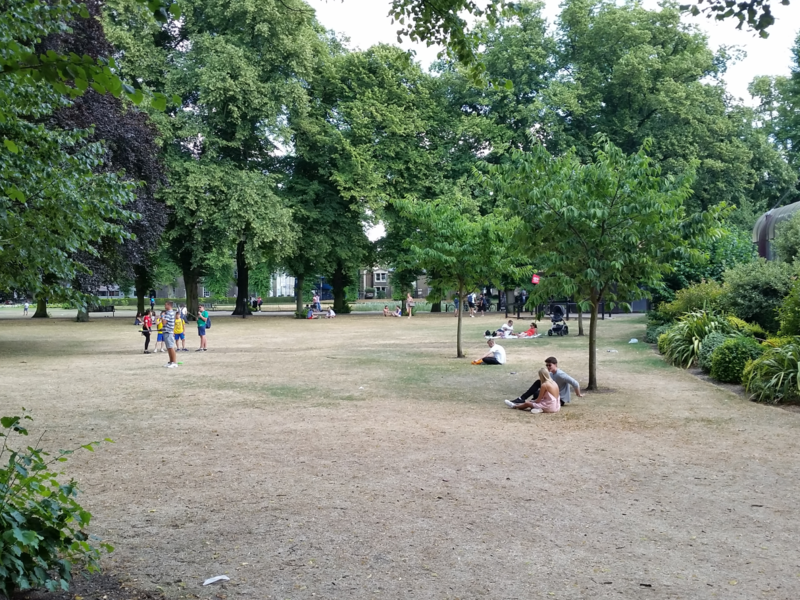 Last summer in england in every parkland and garden squares was turned into a brownish, sunbaked and parched areas. Pic. 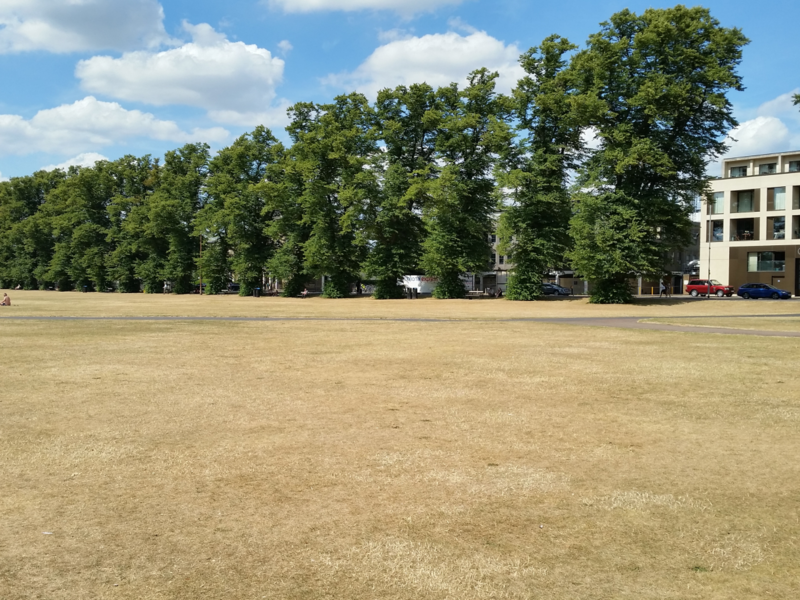 46 Parched Parker’s Peace in Cambridge on 4th July 2018 as an visual effect of the big drought. – A heat wave strongly boosts the domestic tourism trade. During the last summer the amount of international visitors to the UK increased significantly as well as domestic tourists. Many British tourists decided to spend the holiday in their own country. 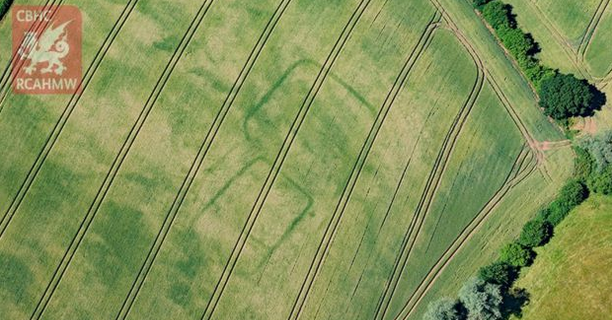 – Long lack of precipitation caused vegetation to be revealed many curious historical objects and cultural heritages across the UK country thanks to cropmarks painted into the landscape. A prehistoric or Roman farm has been discovered near Langstone in Newport area. 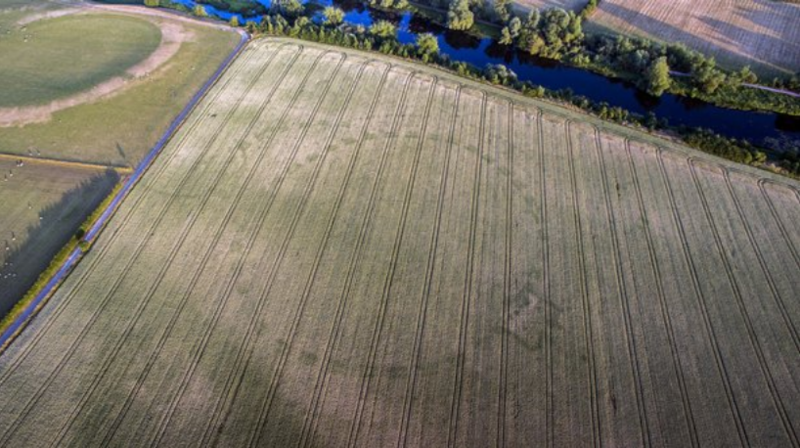 In another place, the 200 m diameter henge has been discovered from drone perspective. Pic. 47 Newly discovered a crop marks of a prehistoric or Roman farm near Langstone, Newport (Wales)(Bbc.co.uk/RCAHMW). Pic. 48 A crop marks of an medieval castle newly discovered near Castell Llwyn Gwinau in Tregaron, Ceredigon (Wales)(Bbc.co.uk/RCAHMW). Pic. 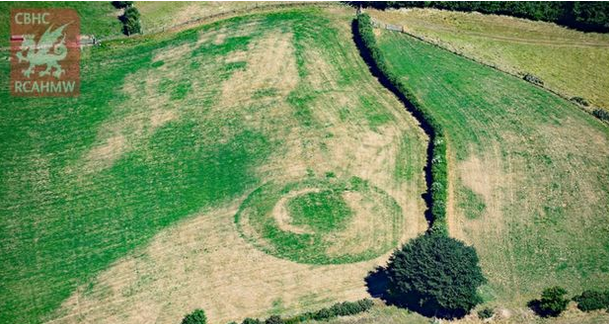 49 Newly discovered henge near Newgrange (Irleand)(Rte.ie). 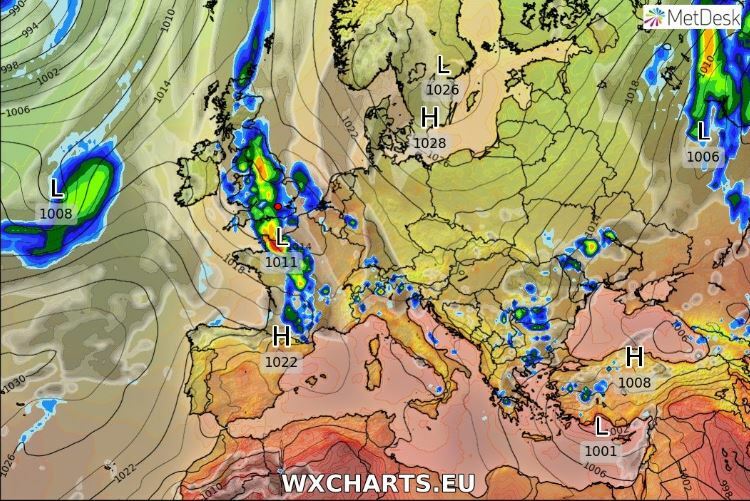 This type of weather occur during the summer, when a blocking antycyclone (often the Azores high), that forces other low pressure systems around it, usually to the north west. 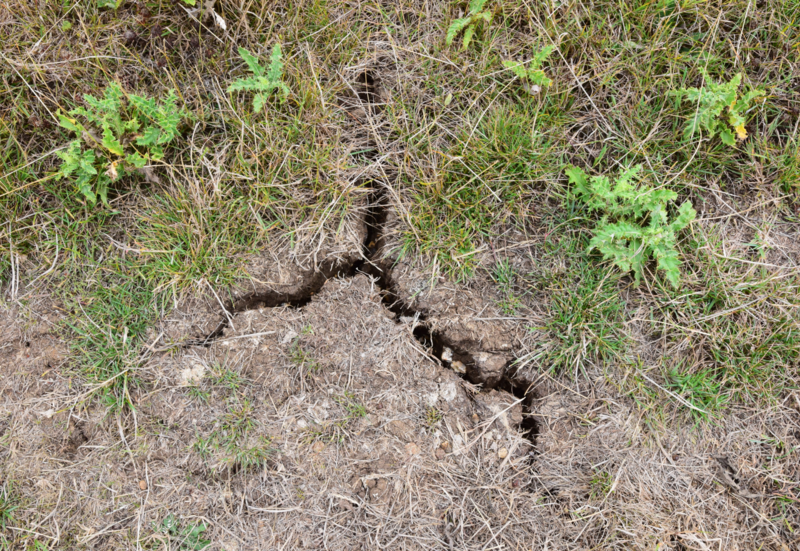 This situation causes a hot and dry weather for a long time in southern part of the UK, whereas north and northwest regions of the country often receives above average rainfall. A factor, that can decide about the strong high presence is a sea surface temperature anomalies in the Atlantic. Basically, when the observed sea surface temperature is lower on North Atlantic, then warmer ocean temperature anomaly is observed south of tropic of cancer. This is a part of the Atlantic multidecadal oscillation, which incurs a different air circulation pattern in the atmosphere, which lead to develop a heat wave across the Europe. The ocean anomaly is linked to a stationary position of the Jet Stream that favours the development of high surface temperatures over Central Europe during the heatwave (Duchez et al., 2016). The jet stream – a core of strong winds around 10-13 km above Earth’s surface steer weather around the globe. When these winds are intense, they bring storms. On other ocassion, when they are week the calm weather occur likewise during last summer. Because now the jet stream is extremely weak then atmospheric high pressure systems are lingering for long periods over the same place. A weakening of the Jet Stream is caused by decrement of the temperature difference between polar and lower latitudes, which I have been described in this article. The last hot and dry spell in central and western Europe was a combination of both aforementioned factors and the climate change process, that leads to increment the temperature around the Globe. This ongoing trend of warming cause also land surface and the atmospheric circulation system changes. I have described the hottest summer in British Isles and Europe. I put a lot of weather forecast maps, that in places could not reflect a real weather patterns, because these maps were only a predictions. However the differences between forecast and real pattern were not so huge. Concluding this article I would like to say, that if somewhere is warmer than normal, in another place must be colder. This is perfectly reflected on the surface temperature anomaly map for Europe, where western part of the continent is much warmer than usually unlike to eastern part, which is colder. A main role in this scenario plays the Jet stream, which is weakening due to global warming. The results we could see this summer, being recognized as the hottest one. A weak jet stream causes a calm weather with lingering high pressure areas, pushing the hot air far north for long period of time. By the other hand in other parts of the continent we could see a never ending cold and rain. Moreover an “omega” shape of jet stream caused unusually bad weather in regions, where it should happen in the summertime. The best example was flooding in Greece and Balcan Penninsula. The jet stream behaviour brought such an extremal weather patterns, not only a heat wave but also unusually low temperatures even with frost. It means, that in terms of a weird weather caused by global warming we should expect literally every kind of clime throughout the year on European latitudes. Next to extremely hot and dry spell an opposite weather with lomg-term rain, flood or exceptionally low temperature occurs. The warming trend will cause a similar, even worse weather patterns in future for sure. There is a lot of things to work with for sure in order to prevent the environment and human life. 2.08.2018 Nytimes.com: The highest peak of Sweden has been melted down. The Guardian: The big heatwave: from Algeria to the Arctic. But what’s the cause? Walesonline.co.uk: What causing the UK heatwave?